The country’s oil and gas import in August increased 70% from July and was equal to the figure of the same period last year. The country’s import value for oil and gas in August was up 68% month on month and 50% year on year, the General Department of Vietnam Customs reported on Friday. According to the Ministry of Finance, the Hiep Phuoc Power Company imports mazut oil for electricity production purposes at its plants, the oil not being for sale on the domestic market which necessitates its taxation. The Ministry of Finance added that, as tax exemptions would only be allowed in cases of extreme necessity, the Hiep Phuoc Power Company would still have to pay a tax of VND300 per kilo for imported mazut oil. The application of waste gas in drying scrap steel as well as the use of compressed natural gas (CNG) to replace fuel oil in steel billet blast furnaces with a capacity of 80 tonne/hour has helped the Southern Steel Company (SSC) reduce energy consumption by 30kWh/tonne of product and fuel costs by VND110,000/tonne. Oil output reached 9.64 million tonnes, making up 64 percent of the year’s target, while gas production stands at 6 billion cubic metres, representing 73 percent of the target for 2011. Previously, with the Ministry of Finance (MoF)’s decision of adjusting the diesel oil price from 14,750 dong per litre to 18,300 dong per litre from February 28, 2011, increasing 24 percent, causing an increase of 7 percent for railway transport costs. Meeting all the domestic and international standards, Jet A1 petrol made by Dung Quat Oil Refinery has been provided to some partners and has served 100 successful flights carrying specialists, engineers and workers from mainland to the oil rig in Vung Tau over the last many months. Asian gas and oil markets represent a major portion of Premier’s future growth potential to 75,000 barrels of oil equivalent per day in 2010 from 42,800 last year, said Robin Allan, the firm’s Asia director, at an industry conference in Singapore. The information was released by Nguyen Hoai Giang, General Director of the Binh Son Petro-chemical Refinery Company, a subsidiary of the Vietnam National Oil and Gas Group (PetroVietnam). Nguyen Cong Hoan, vice president of Hanoi Redtours, blamed the depreciation of the dong and rising oil and petrol prices for pushing up the cost of domestic tours. “Our tour packages have almost doubled in price compared to last year,” he said. Food and food-related products have witnessed a strong surge at 2.47 per cent, directly impacting the CPI this month as these commodities account for 40 per cent of the total CPI market basket. Food and beverage prices, especially of pork, cooking oil, milk and vegetables and fruit, have increased sharply and are likely to continue to rise into February. The price of pork jumped strongly by 4.98 per cent against December to VND90,000 (US$4.3). The prices of cooking oil, confectionery products and milk increased by 7.4 per cent, 3.2 per cent and 2 per cent, respectively. "The group produced 100 million tonnes of crude oil, 104,000 tonnes of fertiliser, 112 billion Kwh and 116,000 tonnes of various kinds of petrol products," said Le Minh Hong, PetroVietnam deputy director general. The group is expected to pay VND11 trillion in taxes in January, a year-on-year increase of 35 per cent. The company is aiming to earn VND486 trillion (US$23.1 billion) in total revenue by the end of this year. Viet Nam Atomic Energy Institute director Vuong Huu Tan said nuclear power could compete with power produced from imported coal, oil or gas. In the long run, the advantage of nuclear power was the expenditure for operation and maintenance was low, less than 25 per cent of the cost of power compared to 60-70 per cent for thermal power. While oil and gas group PetroVietnam and coal miner Vinacomin shelved international bond issues in recent weeks, EVN, Vietnam’s cash-strapped state-owned power utility, is persevering with an oft-delayed overseas fund-raising plan. The United States was the second-largest export market for Vietnamese shrimp, buying 27 percent of shipments. That’s just behind the 28 percent shipped to Japan. Vietnam exported about 240,000 metric tonnes, a 15 percent increase by weight. The association said the Deepwater Horizon spill, a better worldwide economy and a general decrease in output helped raise prices. On January 10, the two countries signed an investment encouragement and protection agreement and an agreement to establish the Vietnam-Oman Business Council. 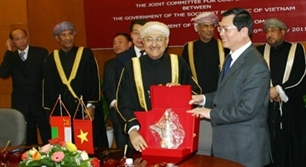 On the occasion, the Vietnam-Oman Joint Committee and the Ministry of Industry and Trade held round-table discussions on real estate, oil and gas exploitation, mining, energy, information and technology, transport, delivery and logistics, tourism, mechanical engineering, banking and thermoelectric power.